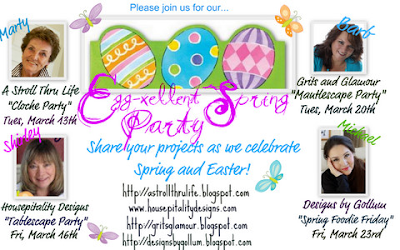 The fabulous Barb of Grits and Glamour is hosting an Egg-xellent Spring Mantlescape Party, and of course I want to play. I don't have a mantle, but I do have a shelf that I play with, so this is going to be my mantle for today. I also want to thank her for my new header design. She is so talented and is offering a free header as a giveaway. She is also accepting orders for custom designs. You will love working with her, she is so talented and has such a fabulous design sense, and her rates are very reasonable. I love my new header. 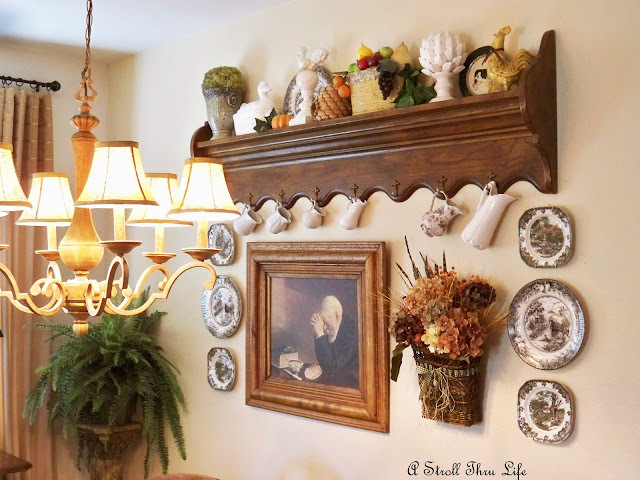 This wall is in my breakfast area and I have it filled to the brim with the shelf, plates and my wonderful painting of Thanksgiving with the Old man praying. I found this shelf at a consignment store many years ago and it is quite massive. It measures a little over 6 ft. long and is 18" high. I have always loved the carving, moldings and hooks. It is a fun piece to decorate and play with. I tied the shelf in with the plates on the wall by also placing one on the shelf. 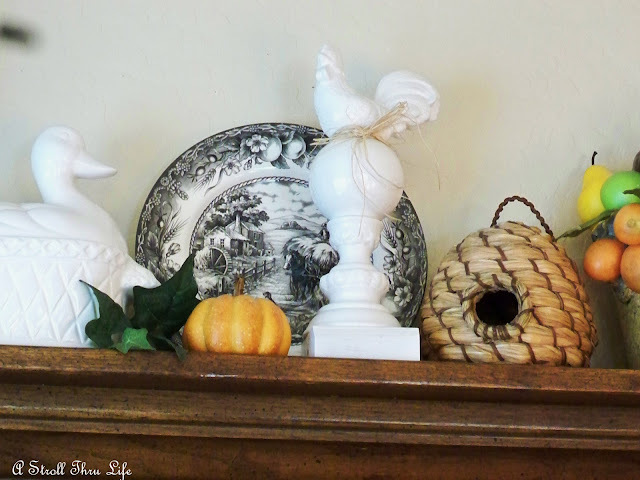 A white duck tureen, rooster and bee skeep are on this end of the shelf. And of course you have to have a colorful rooster. Great shelf for this wall and so fun to play with. Barb's Egg-xellent Spring Mantlescape Party. I can't wait to see them all. As a reminder, PLEASE TURN OFF WORD VERIFICATION. It really isn't necessary and it is so hard to comment with the squiggly words that are almost impossible to read. Be kind to other bloggers and turn it off. Thanks for hosting Marty. These parties are so much fun. Marty, I love your shelf, and what a great piece to accessorize with beautiful things. Love your new header also! Thanks for hosting! So southern! Looks just like a TN easter! Your shelf looks lovely ! We have been having sumer weather I think we have by passed spring and went straight in to summer . I have been consentrating on the yard and gardens more then the inside of the house lol ! I have been planning what and where I am planting my perenials this year plus other plants ! I will check out all the lovely decor though ! Thanks for sharing , have a great day ! Your shelf is prettier than many mantles! Love it and the way you have it decorated. Marty, your spring shelf looks fabulous with the great mix of things on it. Thanks for hosting. Hi Marty! Love your new header! I noticed it right away. Love your shelf and the hooks on the bottom. Oh what fun you could have with tons of different looks! I don't have anything to link up but I came by to say hi! I also love your beautiful collage of plates on your shelf with your basket! !looks lovely with your rooster. I would like to thank you so much for hosting your sweet linky party today. I don't have a mantel in this house (first time) and I miss it! 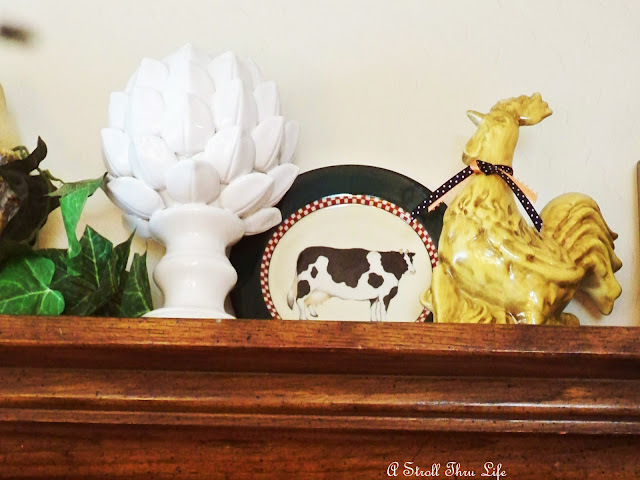 I tend to use the top of my china cabinet for the same kinds of things I would have put on the mantel. I love your new look...very classy! What a beautiful shelf you have, Marty, for decorating! Who needs a mantle when you have that lovely piece? Hi Marty, I love your new header too! I think decorating your shelf is as much fun as a mantle. I think is looks great. I love the roo, and all the fruit. I love the wallscape below the shelf too. Thanks for hosting Marty. Marty, your shelf looks wonderful!!! You have such lovely pieces!!! Thanks for hosting each week! I love your "mantel" vignette Marty! That shelf is such a pretty piece and so versatile, too. I think the brown transferware just "makes" this wall vignette, Marty! Thanks for hosting the party, once again. Oh, and what a nice new blog header! You have such a beautiful home! You always arrange things in such a pleasing manner. You inspire me! I just love your shelf. Gorgeous as always. Thanks for hosting. I never tire of seeing your shelf and enjoy the way you change it up! Thanks for hosting...hope you have a wonderful week! Oh I forgot. Love your new header! Your new header is fantastic! She did such a great job capturing your beautiful home and style! This whole wall display looks lovely, Marty! You always find the best things to "play" with. I have always loved this little spot in your home Marty! That picture is one of my favorites and I had actually found one just like it but sadly enough it was not for sale. Thanx for hosting TTT! Love your new banner and your shelf design too! Thanks for hosting. For some reason I can't see your banner!! I am finally moved over to my new WordPress home and back to linking up - thanks again! GORGEOUS as always, Mrty. I love te piecs tha you put together. That is a wonderful shelf to decorate and you do that so well. It is as good as any mantle. I will check out the party, I have a small mantle on our electric fireplace. All we have room for in our RV. It's cleared right now waiting for Easter decorations. Marty, you do so many great things with that shelf. I have always loved your warm cozy dining room! It looks so cute! Your shelf looks wonderful. Thank you for hosting and have a great week! Hi Marty! Oh, your shelf looks wonderful and is ready for Spring! I do love your new header! It's you and Barb did a great job. I'm ready to go and hook up to her mantel party. These Spring parties have been so much fun. Thank you for hosting TT. I think your mantel looks great. 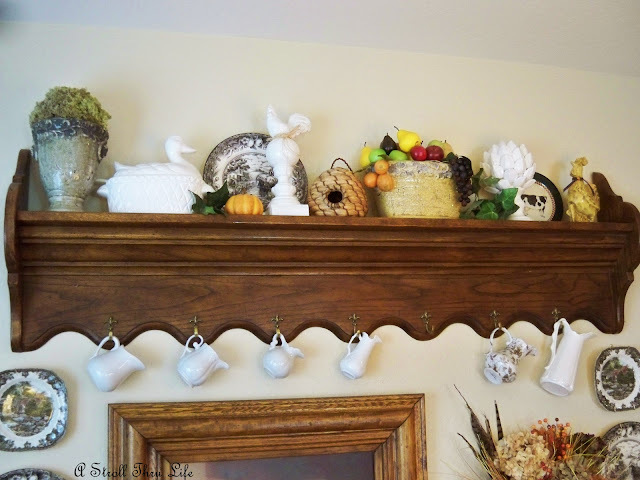 I don't have a mantel either, but love playing with shelves and every other surface. Thanks for hosting. What a beautiful mantel Marty! 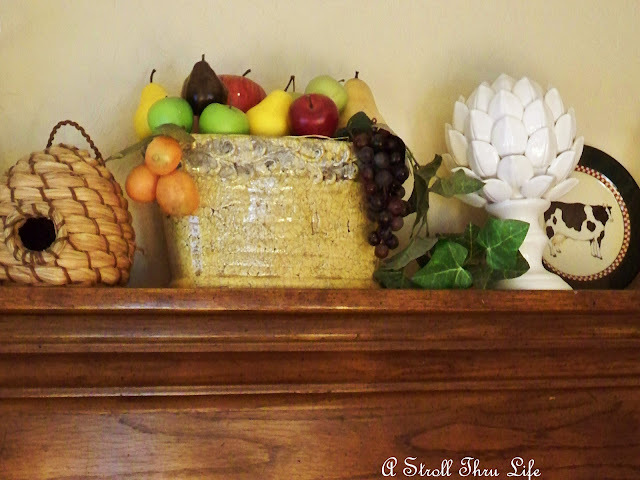 I love all the perfect elements you've used for your lovely mantel-shelf. I don't have anything to make a mantel for spring, so here goes my spring table tea party...you're welcomed to come over for some sweets and tea...or coffee! Thank you for hosting this great party. Your shelf is beautiful, Marty. I wish I was so creative. I just can't put things together and make it look nice. That's why I come here to get my "fix" when I can! Wonderful shelf Marty. It works great! Looks every bit as impressive as a mantel. I always love your touch of farm and country! Your spring shelf looks great. I love the combination of items you chose. Your Spring mantlescape looks very nice. It's very fitting near your breakfast table too. Very pretty Marty! Thanks for hosting! That's very french country. I love Marty. Thanks for sharing and hosting. Marty, I just love all your beautiful spring decor! Sooo pretty! Happy Spring to you! Thanks for hosting Marty. I feel like I am getting back in the swing of things again. I hope I am coming up on your blog roll again. Love all your new buys!! I do have to laugh because I have the same phone!! LOL!